Heaven: Are too many Christians missing the point? I can remember sitting in a small Baptist church reading a little kids brochure with pictures of happy kids going to heaven, and bad kids going to hell. I remember hearing the teacher talk about the streets of gold, no more crying, no more pain if I only accepted Jesus as my personal savior, but if I didn't, my heart would stop beating and I would live eternally in some place filled with fire, death, and destruction. What a mind job on a 5 year old! The Bible is pretty clear on the difference between heaven and hell. At least I think it is? Isn't heaven the place where little babies with wings flutter through the clouds as the whisp away? Isn't there peaceful soft voices in heaven where harps can be heard softly playing over the wind? Isn't there a place where riches and gold abound and we'll never want for anything? Sure there is…made up in some fiction book somewhere. There are so many distortions of heaven being presented around the world, I wonder almost if we've succumb to some sort of fairy tale club. It's almost as if Disney created a magical wonder place where Christians have hooked in, and sought comfort. After all, what's better than Disney World, right? And we have taken this image and made it our mantra. We want to go and work as many people as we can into thinking they need heaven. But what if they don't need heaven. What if they need Jesus? For when heaven becomes the focus of our life here on earth, we've got to look to the scripture and ask just this, WHAT IS IT? At closer look at the Bible there are a few glaring points I'd like to share. The first is the "body" principle. So many people are consumed with the idea of a "new" body. As if somehow you're going to die tomorrow and wake up looking like a super model, right? I mean God wouldn't want any of us to be overweight. He wouldn't want me to be inactive. It's only the athletes and the super models that he blessed, right? He'd obviously want to glorify my body to look like the front cover of some magazine, because that's perfection, right? The Bible is clear that when we die we are in a different state. (2 Cor. 5:8) There's some sort of presence with God that happens immediately upon death. It talks of Jesus resurrection, and then our resurrection to come later. (1 Thess. 4:16) OUR BODIES WILL BE RESURRECTED. Sure there is the 'glorified body' verse (1 Corinthians 15:33-58), but remember; even when Jesus was raised from the dead the nail scars were in His hands. So if Jesus will live through eternity with nail pierced hands, what will we have to live with? So those of you waiting on a slimmer you upon death, it might not be a part of the package. (I'm just saying.) At least it seems that's a component of timing. Again, when Heaven meets Earth it's not about destroying the old earth because it was an evil awful place. In Genesis God called all the creation "good." It's not as though he messed it up the first time, so He has to go and call a re-do on what He made. He's actually in the business of "righting" all the wrongs. He'll put all the pieces of creation back together again, so we have hope that life will be right someday. But that doesn't mean we're living in a cosmic screw up, and there's a place out there where God has created a "better world." He did it right the first time, but with the onslaught of sin in the world, the original creation has been distorted. Paul talks about creation being restored, all things being made new, and the centerpiece on which Christ died and was resurrected. Why would all this matter? Because if we're walking through life simply paying our dues or saying the prayer, or giving our tithes, we're missing the point. Our bodies matter. Our world matters. Our job isn't to sit around and wait on something better! Jesus began a New Creation when He walked out of the tomb Alive and Well. He started the process of righting all the wrongs. He looked death in the face and said, "YOU WILL HAVE NO POWER OVER THIS PLACE ANYMORE." But in our instant culture we look back 2000 years and ask, "So why are people still dying, huh?" It's so silly to think all of history has to be wound up like modern America. I mean really. We think of Resurrection like a fast food order. Jesus has to roll up to the earth and order a #3 with a diet coke and expect it to be delivered in 5 min. or less. Come on! We're not going to find perfection just sitting around and waiting. We're invited to be a part of God's creation, and heaven will be what heaven will be. The point of following Jesus isn't to rack up how many people we've wrangled into the coral of church, or gotten to sign the card at the end of the service, or even how many hands going up in the auditorium confessing their need for God. Our lives should reflect the Glory and Majesty of a Creator who created all things. Our Journey should be to live through the high times and the low times with community around us, and commit to knowing God in an intimate way. We should be consumed with understanding how to love God and love others in a way that tells the world "Creation is being put back together again. This is the right way to live." Sure we can't obtain perfection here. Heaven will be what heaven will be. It will surely be a wonderful place. Don't miss the point. Don't make the streets of gold your sole purpose for living. It's not the life after death we should be concerned with today, it's life inside life we ought to be focusing on. When all the law and the prophets hang on Loving God and Loving Others (Matt. 22:37-40) we've got a lot of work to do. Next Orlando Florida: Teenagers Need a Place to Ask Questions! I love this! SO true. Many people want to become Christians for “fire insurance” yet there is so much to be gained by following him here on earth, Heaven the reward AFTER this life. Great words! well I undersatnd your point and I agree with most of what yuo say , but You missing a point that is important, That this Earth has sufferd Alteration that GOD did not intent for The Earth Or Mankinde . This world we live in is not the same world that GOD created in Genesis , wher The Earth had no killings, sikness ,wars , polutions thi only happend after SIN enterd the world , mankinde has made the World the way it is , GOD ,is not the autor of earth quakes , hunger , hate , false, religions etc. estc. 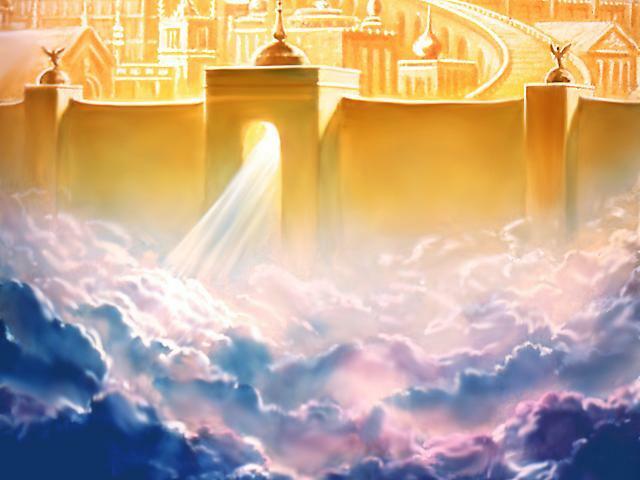 That is why heaven is our only hope and asurance , and the door of Heaven is only JESUS , The way and later on we will have A New heaven and a New EARTH , but for now Heavan is the only thing worth to live for then of course other things will folow . We do need to focus on what is truly important which is NOW, which is the journey. I believe that we are obviously supposed to share the good news…but I believe that it is sown through our lives. I want my life, my joy (even during the hardest of trials) to be a lmap for others…and when they ask why? I can joyfully say because of Jesus! As far as Heaven? It’s too amazing to comprehend. Those that had a sneak preview were challenged with trying to describe it with our words. We will have to wait and see what God has in store for us there – but I know it’s going to be AMAZING!!! Kudos. Our priest says that God cares very much what we do, and I think of this in terms of your comment that when Christ was resurrected, the setting of wrongs to right began; and I think that means it begins with us working to bring the realization of his kingdom on this earth.